With the basketball season coming to an unfortunate end last week, several Berks County seniors got a chance to showcase their talents at Albright’s Bollman Center Friday night. The girls game got underway with several familiar faces and teammates competing against one another. The Blue team, coached by Fleetwood’s Matt Kellett and Wyomissing’s Kristin Hawley featured Kelly McGreal (Daniel Boone), McKenzie Adame (Antietam), Cassandra Noray (Reading), Avery Marz* (Wilson), Kendra Bamberger (Fleetwood), Katye Johnson (Exeter), Hayley Kochel* (Twin Valley), Jill Deiley (Schuylkill Valley), Carley Brew* (Wilson), Lauren McEwen (Schuylkill Valley), and Danielle Carabello (Wyomissing). 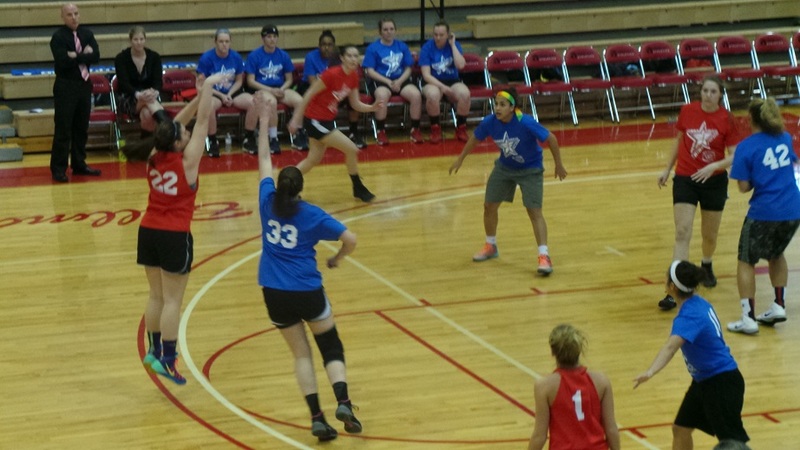 The Red Team, coached by Hamburg’s Mike Garman and Brandywine Heights’ Jim Moll, featured Katrina Balatgek (Berks Catholic), Hannah Schoenly (Hamburg), Brooke Boyer (Tulpehocken), Emily Heere (Muhlenberg), Elizabeth Christman (Muhlenberg), Hannah Bankes* (Kutztown), Ivory Bailey (Wilson), Claire Jones (Brandywine Heights), Kassidy Lesher (Hamburg), Jessie Wallace* (Wilson), and Jamie Fisher (Tulpehocken). The victorious Red squad got their top scoring contributions from Elizabeth Christman and Ivory Bailey, who each finished with 11 points. Meanwhile, Hannah Schoenly added 3 three pointers for a total of 9 points. Despite the loss, Blue was led by Cassandra Noray, who finished with a game-high 12 points. Hayley Kochel added 11 and Carley Brew poured in 10. During halftime of the girls game, Hannah Schoenly of Hamburg won the three point shooting contest. 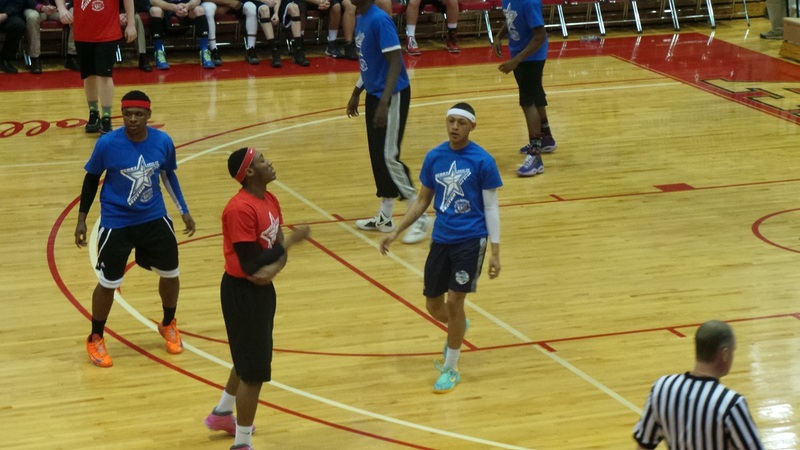 In a game where defense was at a premium, the boys senior all stars took to the floor after the girls game. The Blue team was coached by Hamburg’s Ryan McGinley and featured Patrick Barter (Hamburg), Jalen Flynn (Muhlenberg), Brett Gilbert (Exeter), Nolan Lee (Antietam), Dexter Jordan (Conrad Weiser), Jaylin Calloway (Wilson), Nana Foulland* (Berks Catholic), Bryan Mellen (Tulpehocken), Meme Burdine (Reading), Brock Kovach (Wyomissing), Brian Schumacher (Fleetwood), and Tucker Landis (Kutztown). The Red team was coached by Ryan Wehr of Brandywine Heights and featured David Polisano (Twin Valley), Sam Smith (Wilson), Kenny Worthington (Daniel Boone), Travaun Coad* (Wilson), Stevan Rodriguez (Gov. Mifflin), Mitch Burns (Oley Valley), Cooper Kutz (Berks Catholic), Sean Ziegler (Brandywine Heights), Gilberto Benz (Reading), Chase Hartman (Wyomissing), Isael Abreu (Reading), Andy Orr (Conrad Weiser), and Nelson Hine (Muhlenberg). In a game which saw several show stopping dunks, the red team emerged victorious. The Red team was led in scoring by Sam Smith, Isael Abreu, and Andy Orr, who each finished with 18 points. All three players dunked during the game as well. The Blue team got a game-high 20 out of Nana Foulland, who was 4-for-7 from three point range. Yes, really. Patrick Barter would also add 14 for Blue. Wyomissing’s Brock Kovach took home the three point shooting crown for the boys.